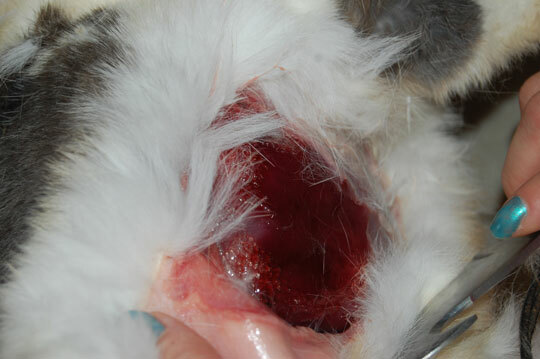 Uterine cancer is extremely common in rabbits. I believe the percentage in some studies that have been done is 85% in older, unspayed does. I have never dealt with this health problem over the years, but I have been well aware of it. I do not spay my does that I retire and keep here after their breeding career and they have done well thus far. One of my retired does, Hoppin's Sugar Dust, was almost 6 years old when she got Uterine Cancer. I do not exactly how long she had it or when it started. But, I do know that it started to greatly affect her 2 months before she died. On December 19, 2011, Sugar passed away. 2 months prior to this, she had went off feed. She would eat parsley, carrots, apple, vitamin C, rabbit nutridrops, oatmeal, oats, hay and goat milk. She would eat no pellets and drink no water, only goat milk. 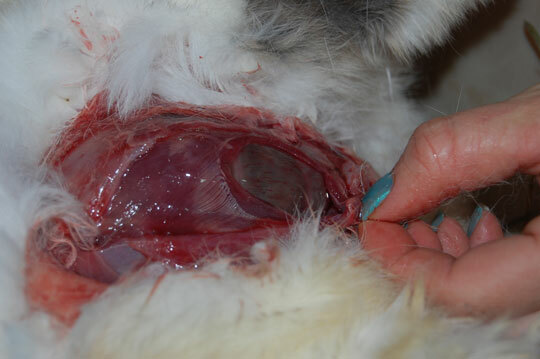 Whenever I have a rabbit go off feed, I have a few routine treatments I do for gut issues. I treated her for a hairball, coccidia, and GI stasis. I syringe fed her water with Adolf's meat tenderizer, electrolytes and powdered vitamins in it. I gave her rabbit nutridrops orally. She ate 3000mg of chewable Vitamin C's a day. She did quite well with this and acted very normal, except for not eating pellets or drinking water. She maintained condition very well too. 2 days before she died, she stopped moving around very much and acted very solemn. I could tell she was going down for good. During these 2 months prior to her death, I could palpate lumps about the size of a very large/oblong grape throughout her entire abdomen. From just below her rib cage, all the way down between her legs. I know how to palpate very well, so I knew what I was feeling was not a gut blockage or problem. I immediately thought it was uterine cancer. I had done everything I could for her as far as treating her for any issue that may be present, so if it was uterine cancer, I just decided to make sure she ate a decent amount of veggies, fruits, vitamins, hay and goat milk a day and see how long she would stay well. She never acted like she was in pain, but acted quite alert. Except for every now and then when I would put her down into her cage, if I had pushed on her belly too much. But, I was very careful with her when I held her, so it was rare that she would act as if she was in pain. The day before she died, she acted like she was in a little discomfort, but overall was okay. Once she passed away, I did a necropsy on her because I wanted to see exactly why she died. As soon as I cut her open, my suspicions were confirmed. The mass in her uterus was huge - the whole entire length of her horns. She also had bloody urine, but I didn't realize what it was until I thought back on it. These are her intestines, which are almost completely empty. I thought I would take a picture of her intestines to show that it was not a GI stasis problem that killed her. The large mass was indeed her uterus.